18/8 Eighteen Eight Fine Men’s Salons overstates the success of its franchises and understates its franchise failures, according to a franchise owner who provided this anonymous complaint. We invite others to validate or dispute this claim – and share their opinions of the Eighteen Eight Fine Men’s Salon franchise, the Griff’s Shave Bar franchise, and franchisor Ultimate Franchises Inc.
Eighteen Eight Fine Men’s Salons – How Many Open / Closed / Rebranded? is an anonymously submitted guest post penned by a current or former 18/8 franchise owner. We have not verified the claims made herein, and invite readers and the company to validate or dispute this and other complaints regarding the 18/8 Fine Men’s Salon franchise or the sister concept Griff’s Shave Bar. The writer believes all information and numbers to be accurate, but invites readers to verify independently and draw their own conclusions. Eighteen Eight Fine Men’s Salons – How Many Open / Closed / Rebranded? Submitted by An 18/8 Franchise Owner. In a recent Forbes interview (dated 6/13/18), franchise CEO (Chief Exaggerating Officer), Scott Griffiths severely overstates franchise success, open location count, and units in development of the 18/8 Fine Men’s Salon franchise chain. 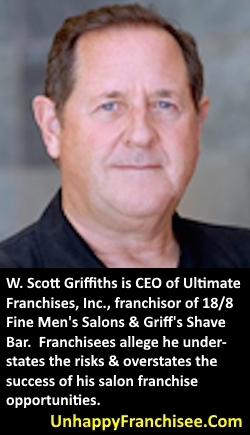 Scott Griffiths is also the principal of Ultimate Franchises Inc. and the sub-brand Griff’s Shave Bar. The premise of the article is how the financial crisis helped 18|8 Fine Men’s Salons grow faster through franchising than it would have organically. While franchising has helped the 18|8 brand grow in store count in recent years, the rapid closing of locations throughout the country has led to many franchisees losing their life savings. Eighteen Eight’s own website only lists 61 operating locations. Where are the other 39? In a recent internal call with franchisees, Griffiths claims 75 open locations. Did he mean “nearly” 75? By our count, 24 stores have closed, including Irvine Westpark, which was once the highest grossing location in the country. Considering all store closures, rebrands, and corporate takeovers, this equates to $14.3-$25.1 million in lost investor value. This total does not include resales that have netted the original owner negative value. Share your personal Growth Story with 18|8 Fine Men’s Salons in the comments. NOTE: We invite all parties discussed to share corrections, clarifications, explanations, rebuttals, and alternative points of views. Franchisors, franchisees, employees and others discussed here can leave comments below or submit rebuttals and clarifications via email to UnhappyFranchisee[at]Gmail.com. Opinions and representations expressed are those of the parties alone; do your own research and make up your own mind. We are a discussion site and invite all opinions from all points of view which can be left as comments or submitted to UnhappyFranchisee[at]gmail.com for possible publication. Anonymous commenting is fine. Please consider supporting our effort with a contribution to Unhappy Franchisee. 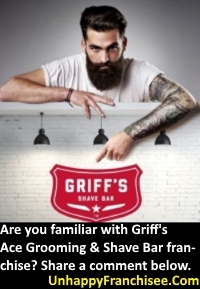 ARE YOU AN 18/8 EIGHTEEN EIGHT FRANCHISE OWNER OR GRIFF’S SHAVE BAR FRANCHISEE? WHAT DO YOU THINK OF THE ULTIMATE FRANCHISES, INC. CONCEPTS AND SUPPORT? IS SCOTT GRIFFITHS EXAGGERATING THE SUCCESS & UNDERSTATING THE RISK OF HIS FRANCHISE OPPORTUNITIES? What REALLY Uncorked Cork & Olive? The Feds must look into these thieves. They are Con Aritsts that steal your money & paint this picture of everything rainbows and unicorns. Scott Griffiths has money in off shore accounts and everyone around him is just as responsible as him. SOMEONE OUT THERE must know how to get these guys arrested, it’s been going on long enough. Our lives are ruined because of these thieves, it’s time for payback. Jennie, please take a few minutes to file a complaint with the California Dept. Of Business Oversight, and your state’s equivalent oversight body. If the federal government reopens some day, you may want to contact the SBA office of the Inspector General, who is rumored to have a quiet investigation going out of their San Diego office. One might also research Scott Griffiths crime(s) alleged at the local level by calling the Orange County Sheriff substation in Aliso Viejo, CA, which serves his adjacent community of Laguna Niguel. These are really bad people, though. So be careful. Once they are cornered, I wouldn’t rule out the possibility that these criminals will become violent. How many of you would be willing to contribute $$$ to a coordinated information campaign that would spread the word via the media & Internet and also coordinate complaints to multiple relevant state and Federal agencies? Smart zees learned a long time ago to question Scott & company at every turn. Those who closed their stores before they drained their life savings were smart. There was never any substance behind this franchise. In hindsight, we know there is a reason that corporate only built four stores, including the one they closed in the Del Amo mall that they were not forthcoming about, like everything else, to the would-be investing zees. Future zees asked, but it is clear, like so many other statements leading up to their decision to invest, the reasons given were simply not true. It is clear now why that they were racing to sell so many franchises in spite of being advised to build slowly (quality first). One of the more significant untrue statements made by 18|8 and St. Gregory channeled as their representative is that this was employee staffed model. (They followed up at 18|8 U before folks had signed their personal guarantees to build their store.) Even though they sold it this way, their own master stylists were contractors. They repeated this “employee model” over and over such that virtually all franchisees heard this on the various discovery days held over the years. Corporate even developed employee commission scenarios based on what you charged for services. 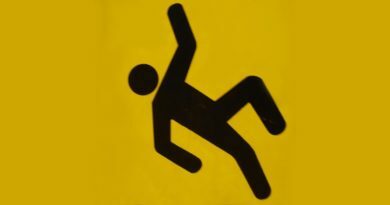 Selling this as an employee model ensured that they could not run afoul of any legal challenges. The funny thing is after multiple corporate officers confessed in various sidebar conversations that they indeed had contractors at the master level after franchisees had already purchased development rights, they also kept denying it in other circles. Over and over they told potential franchisees 18|8 was an employee model but did not mention that their own largest revenue producing group, master stylists, were contract laborers. Sold one thing, did another. They never came clean on this aspect of talking out of both sides of their mouth. The problem for corporate on this subject is that are so many witnesses these statements and that was one of the main pillars in the model sold. I do hope that Scott, and what few remaining enablers like Chris Brown and Andrew Hulse, who for some reason are choosing to spend much of their working years in service to 18|8, will develop a conscience in spite of any financial conflict of interest when talking to fellow franchisees. Scott, Brigitte, as original officers, do the right thing. Come clean. Look at yourselves in the mirror. The gig is up. This whole thing was all a house of cards from the start. Franchises are supposed to have low failure rates in return a percentage of the gross, but the 18|8 foundation was shaky, at best, from the start leading to the state we are in. Quit taking a portion of the amount we pay for vendor products/services (rebates) etc. that you haven’t advised us of, though required. (Yes, Scott, a number of times the vendors, unhappy with you, have admitted to struggling franchisees of the cut you get.) Cut your royalty fees. (When you consider the undisclosed rebates you get from us, it makes the profit-killing 8% you get look even more absurdly high.) Do what you can so the remaining franchisees that trusted in you do not lose their life savings. Think of them. Put meaning behind those hollow statements about caring for our success on the Big Hug calls. Admit to the obvious that lays bare for all to see. This would be a start to the healing those who believed you so much they decided to sign personal guarantees and invest their savings. Does anyone know who Scott’s new lawyer is? I called Timothy Dillon’s office to discuss the letter from GoCap and they told me that they no longer represent Scott Griffiths or Ultimate Franchises. I had a lawyer friend look up some court docs on the recent lawsuits and found that Tim Dillon as well another lawyer from Irvine have recently asked to be relieved from representing Ultimate Franchises due to unpaid legal fees. Seems like Scott lost big on a couple cases, can’t pay his lawyers, and has no legal representation at this point. I truly believe in Karma. The bottom line is that we must continue to bring awareness to this sham of a franchise. We must ALL remain diligent with posting on this site and any other sites that will inform potential investors of these thieves, liars, con-artists. I do not wish anyone to go through what I and other good faith franchisees have gone through with this disgusting 18/8, Ultimate Brands garbage. They ALL need to be investigated. Every single one of them need to be investigated and arrested. If not, Karma will have a field day on them and anyone around them. What other sites are people posting on? Thank you to Unhappy Franchisee for keeping us alive and bringing awareness. KARMA. Could you please provide additional information on the Del Amo Mall Corporate store? Was it a corporate owned location that was not disclosed in the FDD due to poor performance? When was it opened and disposed of by corporate? Darby’s Dad- Curious to know what W. Scott’s alleged local area crimes consist(ed of… At this point nothing much would surprise me. Don’t understand why these guys are not being investigated/charged with felony wire fraud. Thieves and liars. they knew how to take our money, they gave us no support. I hope they all rot in hell. Liars, and thieves. I hope they all rot in hell. I’m glad someone mentioned Andrew Hulse in here. He’s another two-faced bum. One minute he’s telling all the franchises how much he dislikes and distrusts Scott Griffiths, and then a couple months later he’s working for him. One minute he’s berating another franchisee about questioning his ‘integrity’ because he was in the Navy (as if that makes his integrity unquestionable), and the next minute he puts himself in the same division as Chris Brown. My analysis is that Hulse didn’t realize how badly he burned himself after opening an 18/8 in Minnesota after the franchise registration in that state got revoked (he invested a ton of money and resources in an asset that could not be resold as an 18/8), so he just decided to double down and be one of the scammers living off the backs of others. I’ll just pause there, since it’s bad enough for him to have to deal with Griffiths as a boss on a daily basis, while also pretending to be Mr. Integrity. It was in the Irvine Spectrum Center 18|8 store that closed in 2008, not Del Amo. It’s a different situation and may not have required disclosure, not sure, but obviously would have been of interest to investors since it was still a version of an 18|8 and so many of those, in hindsight, have failed. This18|8 had a medspa. The FDD does note for the starting month for the other three 18|8 stores, as well as that they had operated continuously. Why not note the situation with 18|8 men’s salon that had the medspa under common management/ownership? The Del Amo closure is just another franchisee closed store. Basically they did their ‘stop paying rent and ask the landlord to renegotiate the lease’ trick, then got evicted. Typical Griffiths. Ok, now I am even more convinced that corporate should have been transparent about this store opening and closure. (Someone might want to take a picture of this yelp info before they take this down.) Some people who heard of this store inquired about it and said Scott dismissed it as being a different concept. Hum… All the reviews are about haircuts. When you read the review details, it sounds just like an 18|8. Maybe corporate hung their hat on not noting in the FDD because of it being closed for 3-years before they started franchising. Or, maybe another shell game with one of their legal entities. Below is a cut & paste on the yelp page. Ron Love only alludes to things in common with current 18|8s. Maybe I am missing something. 18|8 MEN’S Haircare and Grooming Services are the reinvintion of the barber shop providing hair and grooming services in a relaxing environment focused on the Unique needs of men. At 18|8, our stylists and staff provide the advice, solutions and consistency men deserve in a wide variety of services and treatments, including haircuts, hair coloring, MANicures, face treatments, scalp treatments and massage–all provided at semi-private stations. At 18|8 men can have a unique experience designed to meet their specific needs, rather than being an afterthought at a woman’s salon or settling for a clip-joint-quality haircut. I agree 100% that “corporate” owned Spectrum location should have been disclosed in all FDDs issued post-closure. Fraud, fraud, fraud. No gentlemen or ladies at Ultimate Franchises and all of the other entities they go by in the past, present, or future. Scum. I remember at 18/8 University, Ron Love telling us that we should cut paper checks to our employees instead of direct deposit, because sometimes employees do not deposit for a couple weeks or sometimes lose the check or forget to cash altogether. Looking back at these comments, it’s comical how desperate these people are, even at a micro level. Tiny pathetic losers. Cockroaches. I’m embarrassed to ever have associated with them. So, below is the cost of goods sold %, by year, computed from the FDD for the 4 years the information was provided. What do you think the odds are the Costa Mesa and Westpark had 47.0% with Pasadena having the exact same % for exact same years for 3 of the 4 years? This just happened to be the same figure Lance told zees to use as a modeling assumption every single year? Imagine that. 11 of 12 computations from the FDD at 47.0% COGS. This business has fluctuating retail sales, different stylist levels with different price points for different services and high turnover. Let alone the % being the same 4 years YEARS in a row, has anyone has even had 4 MONTHS of COGS in a row at the exact down to the tenth %? Me neither. I’ve watched Griffith’s struggle with Excel. It was quite humorous. Just give this man a box of crayons. He’s more comfortable with a coloring book than a spreadsheet. I understand when Scott presented the initial discussion of hair loss program roll-out, he had these ridiculous numbers on his spreadsheet with zero science behind of the numbers. Numbers just pulled out of thin air. A zee questioned him on his numbers, after requested input, and Scott got upset. If you are confident in your information, you don’t get upset by questions, you welcome it. If you are insecure, you are much more upset. Scott has always been a legend in his own mind as evident by how he instructed the PR firms to inflate Scott’s bio so much in store announcement, franchise sales material, etc. So, Scott has taken away from us current franchisees the contact information that with helps in reaching out to fellow franchisees. I guess he doesn’t want us helping our help fellow franchisees or getting their advice about what they did about certain situations. Nice. Maybe paranoia has set in. I thought we were the 18|8 family. Or, maybe that was just more hollow words at 18|8 U.
I believe the odds of every COGS ending in .0% (a more rounded number than say 0.4%) is 1 in 10 billion. There is a 10% chance a 2nd number ends in .0% when the first number ends in .0%. But the FDD has all 12 in a row calculated % to be 0.%! These seemed to be managed outcomes. Here is the math: 10% x 10% x 10% x 10% x 10% x 10x % x 10% x 10% x 10% x 10% x 10% x 10% = .0.0000000001%. Hum….yep, that is pretty amazing. Thanks for the probability calculation, Lee. Just because ZZ Top used the term “hum” doesn’t mean it’s Lee. Does it? Could be a misdirection. As a current franchisee, today I noted Ange sent a note forbidding us from purchasing American Crew’s new Acumen brand. Apparently, the kickbacks haven’t been negotiated yet. You just threw some serious shade at the FDD…..That calculation is the type of thing Attorney’s love. If you pulled those numbers from the FDD, specifically item 19, you really ought to take it to an attorney ASAP. Might be a get-out-jail-free card. Brandon, many of us (the most fortunate) have already done just that. Everyone else should do the same. And just a heads up. Griffiths will do anything to avoid a courtroom. He’s already about 0 for 20 in legal battles and doesn’t even have a lawyer at this point. To anyone left, get out while you can! I’m wondering how long this house of cards will remain standing. Still find this to be a great idea. But people got greedy. I feel like a fool for believing them. No crazy thoughts of making a fortune but thought it would bring in something. Corporate his listed most of their locations for sale. Liquidation has begun. With the exception Lafayette, notice the extremely low revenue numbers. Well below anything stated in Item 19 of the FDD. Corporate said there is never a reason to close a store. I don’t think they addressed if there was ever a reason to sell a store at a fraction of the total investment. Also, not clear how “corporate owned store” is a selling reason. I thought some of these were franchisee stores. One of the top stores has a starting asking price at an amount lower than the cost of construction by itself. Palm Springs already sold out? Didn’t they open just a few months ago? Looks like there are even more 18|8s for sale. Some are discreetly not saying they are an 18|8 for some reason, but you call tell easily. Here is Peachtree Corners, for instance. They opened in 2017 and reflect annual revenue of $240K is shown. The asking price is $80,000. Several franchisees (including the now defunct board of advisors) suggested a couple of years ago to lower the royalty fees as a means to keep more stores of stores from closing. It wasn't accepted at the time. Things appear somewhat different now. Maybe all the current franchisees can get lower royalty fees since EVERYONE buying resale on the cheap are apparently getting lower royalties. Why wait? Appears to be worth asking for royalty fees now instead of waiting for the benefit to start with the new franchisee purchasing. Unbelievable that they sell these out for a fraction of their actual cost Especially the newer ones. Such a slap in the face after all the money spent on their “recommenced “ purchases and who to get them from. Always top of the line – always more expensive. Here’s a more inclusive list (19 stores) of the 18|8s for sale on bizbuysell.com. The site has a file (Franchise Maven Resales.xlsx) posted on it that can be downloaded listing all franchise resales. You just sort on Industry selecting Fine Men’s Salon. The annual revenue, per the file, is listed below in thousands. These amounts are before the 8% royalty. Looks like 6 of the stores may often be paying the higher minimum royalty amount unless an accommodation was made. I did not realize that Corp 18/8 had taken over so many stores. That is not a typo. 4-6 just repeat. The desperation has really kicked in for Griffiths after losing multiple lawsuits, getting fired by 4 different lawyers for not paying the bills, and selling fake accounts receivable to a factoring company. Sorry Scotty boy, there’s no one left that wants to associate themselves with you and your toxic business practices. 1) Ultimate Franchises has hired a broker to try selling salons that wish to sell out. All the corporate locations sold (given) back to corporate are on this list. The rest have reached out to corporate, who has “offered” to use their broker in an attempt to find a buyer. My assumption is if a sale occurs, corporate will Avenatti the franchisee and keep the proceeds. 2) At least one of the higher revenue salons on this has already sold to a separate party. 3) Some potential suckers are still out there. I received a voicemail from someone in New York yesterday seeking a validation conversation. I’m calling him back today and will not hold back. This is Sean Kelly, publisher of UnhappyFranchisee.Com. The story unfolding here is pretty shocking – and after running this site for 10 years, I don’t shock easily. I am willing to conduct interviews, gather and review your complaints, do original research and put this into a report that can be circulated to my franchisee attorney contacts, the business, trade and consumer media, state franchise regulators, The Federal Trade Commission and (if warranted) law enforcement, including the FBI. Anyone that wants to see this through-please consider donating. We definitely will be. Unfortunately I see salons on this list that were warned not to open. They ignored the red flags and warnings from existing and past Franchisees. I personally warned some of these to not open, cut their losses and accept they were frauded like others have. They don’t deserve what Scott did to them and their livelihoods. They however continued on which now they realize what a mistake it was. Another sad situation. Another store on the for sale list will be closing in a few more days. Others on the list are not far behind. At least one, if not more, on the list of stores above are already closed. Franchisees who closed, debranded, sold, still in the fold, or who gave their stores back to corporate all feel bad for other friends/investors who will have to live with the result of their savings being drained. 18|8, for the vast, vast majority, has proven to be the gift that keeps giving in a sense, a bad sense. Hard to recover from $700K+ hit. And, to think, most of us were sold a 3-pak to build 3 stores in 3 years within just a few miles from another. It looks like since obviously there was no science involved, we now know, wild guesses (or worse to sell more territories) were made with the money of those who trusted them. Mickey, to your point I drive up and down I-405 frequently and am amazed anyone would think the Lake Forest and Laguna locations would both thrive being a matter of minutes from each other. Same thing with Culver City and Playa Vista, Costa Mesa and Costa Mesa, etc etc etc. PT Barnum was right*. I was the sucker. an individual; BRIGITTE LOVE THEWES, an individual; and DOES 1 – 20, unknown individuals and entities, Defendants. “…UF’s misrepresentations to other franchisees are currently the subject of civil actions pending before this Court and others. Does anyone know how many active or completed arbitrations there are or have been? Below is an Indeed Review by an employee at one of the zee stores that corporate took over – Temecula. I really feel for the employee. They left this 1-star review on Indeed. Temecula is one of the stores listed for sale. Coworkers were fantastic people loved the environment. The customers were even more amazing, where things became an issue is when I realized 18|8 could not make my paychecks or keep the water on. The shelves are bare with lack of product….these things are all signs of a business in trouble. I have been with this company for 1 month and I can’t even get paid. The concept is great, the atmosphere is fantastic, but a paycheck is usually the end result of work. Management had excuses for everything which I can appreciate but I need a paycheck. Anyone know which of the salons listed for sale on biz buy sell.com are corporate owned (via original development or takeover from a franchisee) and which are still owned by a franchisee using corporate’s broker to try to sell? Also, Costa Mesa was one of the original three corporate owned salons listed in the FDD. Are the other two also listed for sale? Didn’t one to f those close and then corporate opened a new location? There are two Costa Mesa locaitons. 1. Costa Mesa Newport Blvd was opened by a franchisee and resold to a new franchisee. I don’t know if corp has taken control back from the second owner . Word of caution to anyone thinking of trying to sell with corp’s help; the original franchisee sale was facilitated by Corp and the seller had to threaten to sue corp to get paid out on the deal. So good luck getting paid if you are using corp’s broker to facilitate. Like everyone else here has echoed – these guys are complete snakes that will screw you at every turn. 3. Pasadena corp was evicted for not paying rent. Reopened in a salon suite rental location. Corp said a new location was being built, but I don’t know if this ever happened. 4. Irvine corp was evicted for not paying rent. Did not reopen. Corp tried to spin this like they were moving to location to Costa Mesa Anton. LOL. Here is the lawsuit regarding the Irvine location (https://unicourt.com/case/ca-ora-ticad-retail-properties-holdings-llc-vs-mana-concepts-inc-857317). Remember, this was the $1.2mil location in the FDD. How could you make that kind of revenue and get evicted? Does anyone know what location this eviction case refers to?